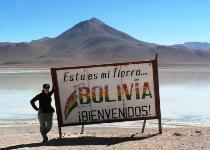 Uyuni in a 4WD; shopping in La Paz; views from Calvario in Copa; day trek on Isla del Sol. 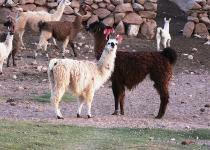 Copa; the llama fetuses sold in the markets in La Paz. Best Moment: Salar de Uyuni. Funniest Moment: Recreating Michael Jackson's 'Thriller' video while on the salt flats. Smells: Sulfur from the geysers; delicious-smelling street food; burning garbage. while trekking in Copa; marching band in Copa. chairs; views from Calvario in Copa; Isla del Sol; 'bowler hats' on the women. trucha (i.e. trout) at Lake Titicaca; 'tuna' fruit which is the fruit from prickly pear cacti; llama meat. two ponchos (all of this cost a total of $30!). packing styrofoam yet tastes like kettle corn. Western Companies Out Here: A Burger King in La Paz. was not needed as of the middle of March. Type of currency? Bolivianos. About 8 Bolivianos equals $1US. 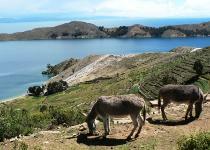 Donkeys on Isla del Sol.